Warmer weather is starting to come back and it's time (or almost time) to get out into those wide open spaces and experience the splendor of nature in this great state of ours. Hiking is the one outdoor activity that can be done by almost everyone. You don't have to be in excellent physical shape or super athletic for some of these trails, and it's fun, educational and healthy! Texas has no shortage of beautiful beautiful outdoor spaces, so here are 10 of the best hiking trails to try here in Texas, and there's a level for everyone. At just over two miles, this is a trail of moderate difficulty that leads down a natural bridge to a natural tunnel that runs under the trail. The trail will lead you out near Lake Theo and past some incredible canyon views. It's a five-mile hike on a narrow trail down a heavily wooded and shady path to Sculpture Falls in the Barton Creek Greenbelt of Austin, but it's well worth it for the dip you can take at the end. One of Austin's most popular hiking trails "falls" might be a bit of a misnomer since it's little more than large rocks causing a small rapids area of Barton Creek. The hike is long but easy, and people tend to make the trek with animals, kids, and guitars in tow. 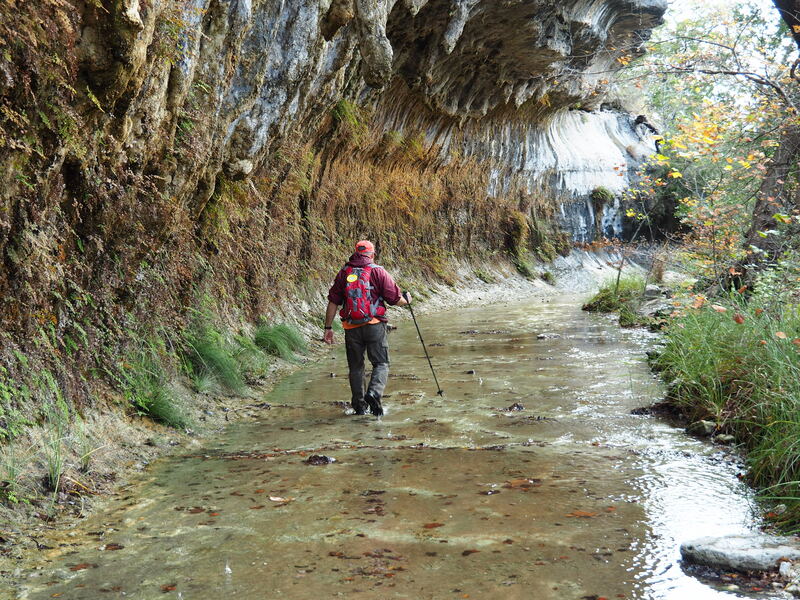 Just outside of Crockett, Texas you'll find the Davey Crockett National Forest and its famous Four C trail. It's a 20-mile long trail, so you don't want to head out there without first looking at some trail maps. Named for the Central Coal and Coke Company (an old logging company), the Four C Trail follows along some now disused tramways once used for logging. East Trail at Lost Maples is not for the faint of heart. This trail is rugged and steep, and considered "challenging". Be sure to bring plenty of water, and be ready for some breathtaking views. Don't visit Colorado Bend State Park without visiting Gorman Falls. The hike is just over one mile, and the payoff is the 65 feet high waterfall buried deep in lush Texas vegetation. If you want, you can even take a guided tour. The trail is very rocky and there's a steep descent near the end, so be sure to wear proper shoes. Summit Trail at Enchanted Rock is an absolute must. Once you reach the summit you can see the vernal pools with the delicate fairy shrimp, as well as some caves and some absolutely stunning views of the surrounding Texas hill country. The trail is 0.67 miles from the base to the top, and though it's a climb, and as hikes go, this one is relatively easy. The Kirby Nature Trail system includes the Inner Loop at 1.7 miles and the Outer Loop at 2.4 miles. Both trails take hikers through some beautiful views and placards along the way identify great examples of the types of ecosystems that exist in the Big Thicket region. It may not be the Rockies, but hiking to the top of the highest peak in Texas is still an accomplishment, and one with stunning vistas. The hike is about 8.5 miles, so be sure to bring plenty of water and food. It's a pretty difficult trail as far as Texas hiking goes, and it will take quite a while. Some people even choose to camp overnight along the trail, but if you don't plan to do that, it will certainly be an all-day kind of trek. The Lighthouse is a famous rock outcropping in Palo Duro Canyon, so named for its tall vertical, cylindrical structure. The lighthouse trail is 5.75 miles of a moderate hike through the canyon. At the end of the trail, there is a bench on which hikers can sit and rest, and admire the view. Not to be confused with the South Rim Trail at another national park just a couple states west, the South Rim Trail at Big Bend National Park is probably the most famous hiking trail in the Lone Star State. At 12.6 miles, it's a considerable hike, and probably not a good hike for a first-timer unless you plan on camping along the way. The trail takes hikers along X and there are quite a few opportunities to encounter wildlife. You have two options to ascend the mountain, the Pinnacles Trail or the Laguna Meadows Trail, the latter of which is more gradual. The views from the top are like no other in Texas. This post was originally published on May 22, 2017.